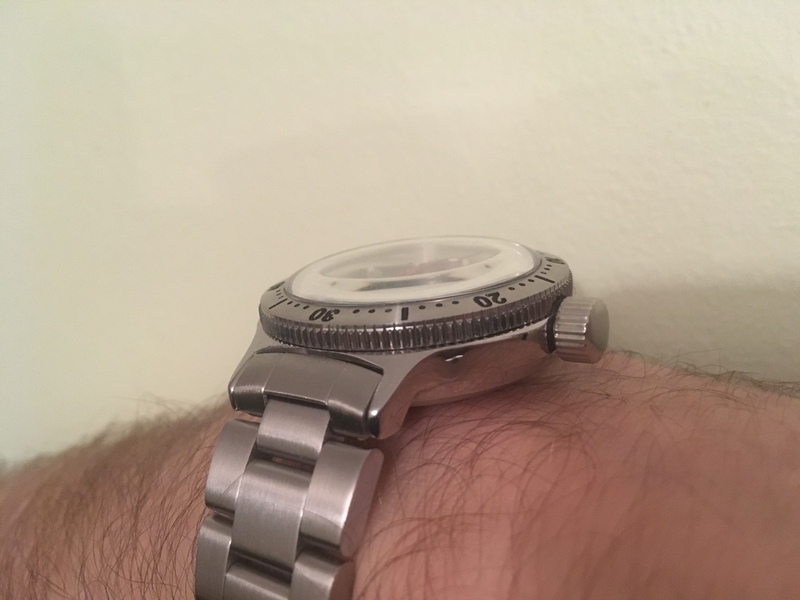 So, I tried the advice I got on the old “Vostok Mods.” thread on how to improve the scratched (stainless steel) case on my vintage Amphibia, and thought I’d report back. First use steel wool and polish the case all over (in the direction of the grains). Then move onto Scotchbrite (also in the direction if the grains). Finally you have 2 choices to finish it off, either a Cape Cod cloth (Amazon), or Autosol (Amazon). You will notice a massive improvement from the steel wool alone, and may even want to stop at that stage. I made myself some simple tools attaching the steel wool and Scotchbrite to the end of the handle of tea spoons using cable tie. I should mention that before I did this I had cleaned the case using first detergent and a toothbrush, and then toothpaste and a toothbrush. It could be that the polishing effect of the toothpaste had already done what could be done using steel wool!? The Autosol on the other hand made a nice difference making the stainless a lot shinier, but as far as I could see it didn’t remove (or add) any scratches. So, I guess I won’t be using steel wool and Scotchbrite again. Last edited by VWatchie; April 2nd, 2017 at 11:20. No reply to my question, will just try it one more time :) Does anyone know where this 420 bracelet is from? Surely this is not the Meranom one?! It says on Meranom site that his stainless steel band for 420 case has got folded links. 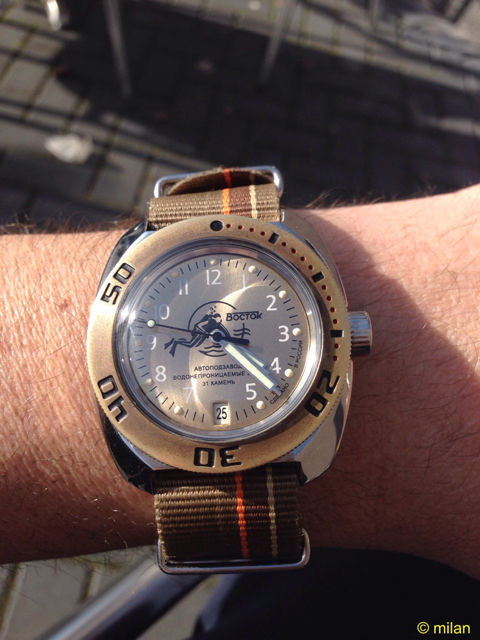 On a "technical" note - I really struggle to fit the clean bezel (Meranom's 01K2) on my Amphibia. Is there a trick I am missing? I have tried about 6 months ago and have failed miserably. I gave it couple of months wait, tried again... sweated over it but failed miserably again. I am unable to "push" it to the case so it clicks to place. There just isn't anything to push, really. I always end up with about 3/4 of the bezel in place, if that makes sense. Is there a tool I need or HOW DO YOU DO IT? That is the Meranom bracelet, as is mine pictured below. As stated on his site it is only the end link that is folded, to enable a close fit to the case between the lugs. 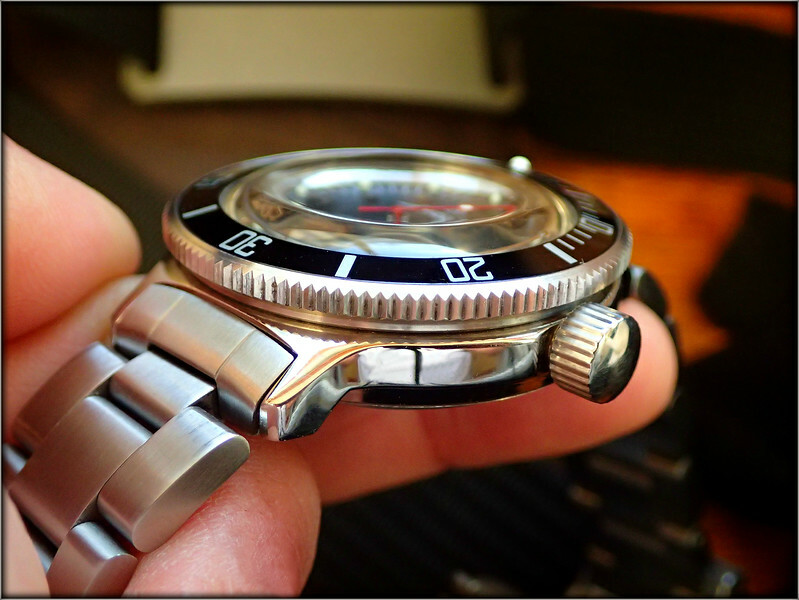 And yes needs a lot patience sometimes even if the bezel is very tight. Thanks a lot sharing experience. Allow me an additional remark. Great "How-to"! Thanks! You know I often ponder whether I should try to restore a watch or simply just leave the patina in. For some reason I appreciate the patina more when I see it other peoples watches. However, I don't care much for dirty watches, new or old. I feel a watch should always be (reasonably) clean. As long as a watch is clean and working I can appreciate it a lot, but for some reason I always want the bling in my own watches. I guess it's a maturity issue. So what about you other guys on this thread; Restore or just clean and if need be service? What do you prefer and why? Thanks! I like a nice clean dial, or as best as can be depending on scarcity of the model. A good example of this is the one and only Pobeda I've ever own which I recently acquired. I've decided to let it go untouched because I think it's perfect the way it is. I have cleaned up a few dials which did improve on their appearance but it's something I dread doing for fear of making things worse, so now I just buy watches which don't need dial work done. sideways2, OKEAH, taimurkhan and 2 others like this. K...did that bezel come that way or was it crafted?? Last edited by sideways2; April 2nd, 2017 at 14:55. I would think most people on this forum are here for some degree of novelty. Even if a replica is literally 100% identical and priced the same, an original still has more inherent novel value because we humans are irrational like that. Creating fakes is fine if you're compensating on price, availability, or something else. These bezels look slightly wrong, aren't very cheap, and make it more difficult to sift through listings to avoid them.